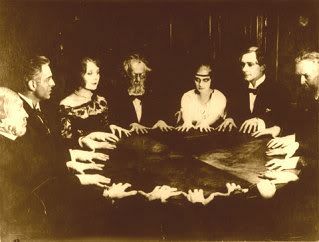 At a séance, four or more people sit around a table in darkness, with palms down on the table. The little fingers of their hands touched that of the people on both sides. All the volunteers concentrate on a dead spirit which is to raise or move it to prove its presence. Suddenly the table trembles, moves and rises up. Effect: A spirit levitating a table. Props: A light-weight square teapoy, four chairs and four volunteers. Method: All occult or spirit phenomena happen in utter darkness. Put off the lights, ask the volunteers to sit on the chairs kept on four sides of the teapoy, and relax. Ask them to keep their palms down on the table, touching the small fingers of the other two volunteers sitting on either side. Ask them to concen­trate on the Spirits, requesting them to show proof of their existence by moving the table or raising it up. When their concentration is complete, to experience the phenomena of the table moving put one foot under the leg of the table and raise it a little and bring it down. While the table is raised by one leg because other volunteers keep their hands on the table, it will balance by itself. Effect: Photographing the dead sprit. The audience sits in a half-circle in utter darkness. You have a camera with you. Someone clicks the camera in the dark where you point out, and a spirit appears on the negative when it is washed. Props: A good camera, film, a cigar and matchbox. Method: The audience is asked to sit in a half-circle in utter darkness and you stand in the front, near the wall facing them. Then you take the lighted cigar, concealing it in your palm, and ask the photographer to take a time shot of the cigar. Immediately hide the cigar and put on the light. The audience will hear the sound of the clicking of the camera. When the film is developed and a copy taken, you will see a ghost with burning head appearing from smoke. Thee cigar looks like a spirit with a long robe. The burning end looks like its head, and it seems that the spirit has materialized from the smoke. The photograph of a dead person appears on a photo paper. Props: Distilled water, mercuric chloride solution, hypo solution (sodium thiosulfate in water,), and black and white photograph on solio paper. Method: After developing a picture of a dead person on print-out paper (solio paper), wash it in distilled water and bleach it in the solution of mercuric chloride. Then wash it and dry. Keep it in a dark place, ready for the trick. To develop the picture, place it in a solution of Hypo and the original picture will appear. Effect: A picture of Satya Sai Baba appears when you blow on a ring, a locket, or a glass plate. Props: Glass plate, hydrofluoric acid, new steel pen, and distilled water. Method: Wash the glass plate clean and dry. Draw a picture on it with a new steel pen using Hydrofluoric Acid. Allow the acid to remain on the glass for 8 to 10 minutes, wash it off with distilled water, and dry the glass with a soft clean cloth. Nothing will be visible on the glass. When you breathe on it the picture will become visible. It will fade out as it dries.